Welcome to Mad Lizzie's Flower Farm located outside Cross Plains, Wisconsin just minutes west of Madison. Our family specializes in growing and arranging unique, uncommon and heirloom flowers and succulents for special occasions and everyday use. There is something truly fascinating about how burying your face into an armload of lilacs or peonies can bring back a flood of childhood memories. Or the way tiny ants work so hard to open those large, fluffy peonies. How a snapdragon can tell a tall, magical tale to a 6 year old boy by simply squeezing the sides of one colorful petal together. A field of sunflowers following the bright, hot sun on late summer day. Honestly, there isn't a flower that I don't love. There seems to be some sort of memory or folklore attached to every one. But, perhaps, most of all, I love the meaning behind flowers. There are a million reasons to give and receive flowers. On any given day, someone's best day may also be someone's worst day. Flowers can brighten the gloomiest of times or provide the final touch to life changing celebration. And then, of course, everything in between. Our little family finds it an honor to grow local, seasonal, specialty cut flowers for our friends, family and community. Every sustainable stem that comes from our farm is lovingly grown from seed, bulb or branch by us. Our hope is to pass on the absolute joy we have for growing, arranging and giving flowers to you and yours. Mad Lizzie's is different than other florists that offer out of season flowers brought in from all over the globe. We create with what is in season and at the peak of its bloom as often as we can. 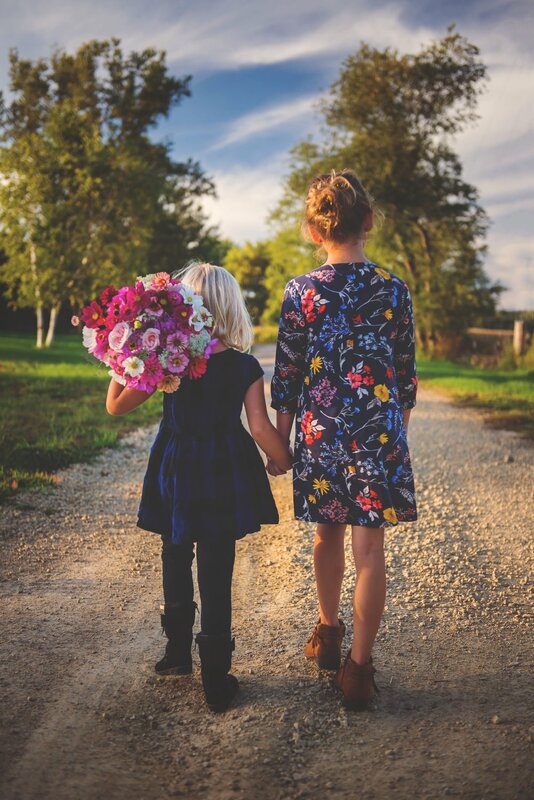 Every bouquet, bucket or boutonniere will be wholly unique; with not a twin in the world, grown on our farm or purchased from fellow flower farms in America. If you are looking for fresh flowers during our growing season, we can probably help. Our Bouquet CSA starts in the beginning of May offering fresh flowers weekly, bi-weekly or monthly for your home or office. DIY'ers rejoice! Our Buckets O' Blooms program offers an opportunity to play with focal flowers, fillers and greens for a wedding or similar event. If you are looking for a unique way to entertain guests for a baby or wedding shower, bachelorette party or similar event, we offer Build Your Own Bouquet bars, Living Wall Workshops and more. Spend a Friday night with your family at one of our U-Pick Sunflower Happy Hours. Or you simply need a mason jar bouquet to cheer someone up. Poke around our website for current availability and event dates. Sign up to receive updates on the Bouquet CSA, Seasonal Flower Availability, Farm News and First Looks at upcoming products.